*A spacious and roomy cargo area to accommodate luggage for four passengers. Additionally the Nissan NV200 features a 150,000 mile powertrain warranty along with a 2.0 liter 4 cylinder engine, which is supposed to get very good mileage. The taxi also has many great safety features like front and rear-seat occupant curtain airbags, seat-mounted airbags for the front row, and Vehicle Dynamic Control. New Yorkers hop into the back of a taxis over 600,000 times a day, so this new taxi is considered to be vitally important. Visitors can see the “Taxi of Tomorrow” at the 2012 New York International Auto Show at the Jacob Javits Center from April 6-15. "We're proud to introduce a new era of urban mobility to New York with the Nissan NV200 Taxi - New York City's Taxi of Tomorrow," said Carlos Ghosn, CEO and President of Nissan at the debut. "The Nissan taxi will deliver unprecedented levels of innovation and comfort to New York's 600,000 daily taxi riders." The Nissan NV200 reflects the ongoing collaboration with many organizations such as the Design Trust for Public Space and Smithsonian’s Cooper-Hewitt, National Design Museum. The project began in 2007 as an initiative to establish the vision for a next-generation New York City taxi. 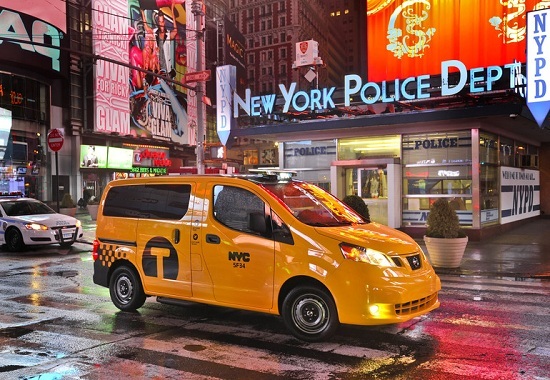 There was a rigorous evaluation process, and the Nissan NV200 Taxi was selected in May 2011 as NYC’s exclusive ‘Taxi of Tomorrow.’ The NV200 should begin to be seen on NYC streets in late 2013 and will be the taxi of the city for the next ten years. "The Nissan NV 200 will be the safest, most comfortable and most convenient taxi the City has ever had," said New York City Mayor Michael R. Bloomberg. "New York City cabs have always been iconic, and now they will set a new standard. The 600,000 passengers who use taxis to get around every day deserve the cutting-edge technology and top-of-the-line safety features that this model delivers." To put it into perspective there are 13,000 taxis that travel around 500 million miles per year in NYC. That's a lot of driving for cabbies! Nissan will take steps to make sure testing is properly done with the NV200. (They have even tested a fleet of Nissan NV200s with Fedex in London.) This will actually be the first New York taxi to be crash-tested with taxi equipment installed, including the partition. The Nissan NV200 Taxi will be built in North America at Nissan's manufacturing facility in Cuernavaca, Mexico. Nissan's manufacturer suggested retail price (MSRP) of the NV200, with all planned standard features, will be approximately $29,700. For more information on the Nissan NV200: www.taxioftomorrow.com. It's a socialist vision. It is not legal from what I know about the law. The USDOT doesn't say you must use Bendix brakes, they don't even specify disc vs shoe brakes. The USDOT specifies performance standards only. The car has to be able to stop fast enough. The NYC TLC has way overstepped here. They have been looking for some car maker to 'get in bed with them' for decades. If I owned medallions I'd challenge any rejection of... say my Infinti, BMW or Benz Crossover NYC taxi at cab inspection time - in court. The TLC has a lot to learn about regulating, if they want to get in compliance with federal standards. I keep reading about how this is the first NYC taxi with a partition to ever get crash tested. If the results were good... I'm sure we'd be hearing about it. Why the sudden interest in federal crashworthiness? These NYC cabs, with their illegal partitions, have been crash testing with real live subjects for 43 years now. The results have been disastrous according to Dr.'s G. Sbordone, G. Doughlin, G. Husk, J. Sherman, A. Konisar, S. Blaugrund, M. Camins, P. Lorenc, K. Sturmann, M. Melrose... all Boston or NYC trauma surgeons, plastic surgeons, chiropracters, and neurosurgeons who have treated taxi partition impact victims for years. I have been ringing the alarm about the lack of compliance in NYC and Boston taxi partition design for decades. Simply get rid of the partition and use the cars people like. Drivers get shot just as easily with a partition as without. With partitions now we get to see low speed fatal collisions because of partition impact, too. Get rid of the partition. It isn't in compliance with federal standards anyway. Years of crash testing with real human occupants has taught the doctors what a partition is most likely to do.